It’s clear for Michael Pearce QC that Australians will have to raise their voice (scream blue murder?) as they eventually did about the plight of David Hicks, before their government will offer the political and diplomatic assistance Julian Assange needs to resolve his current situation. Mr Assange is currently trapped in the Ecuadorian Embassy in London, despite having been granted asylum, since police outside have been briefed to arrest him “under all circumstances”. Curiously, this extraordinary predicament is the result of one judicial authority’s decision; the Swedish Prosecutor Marianne Ny, who refuses after two years to question him anywhere or anyhow but in person and in Sweden. Ms Ny has admitted since February 4th 2012 that she could very well use Mutual Legal Assistance, a commonly employed method of interviewing suspects in other countries, but for reasons she will not explain, deems this process “inappropriate” in the case of Assange. Ny has also refused Ecuador’s invitation to question Mr Assange at their London embassy and has insisted that he be extradited. Lawyer Susan Benn, who spoke outside the Ecuadorian embassy the day Assange arrived there, has pointed out that this “more appropriate” method will involve Assange passing through Swedish custody (most probably for 4 days) before seeing the prosecutor. Benn adds that this provides the ideal window of opportunity to open the sealed indictment for his temporary surrender to the US in relation to a charge of espionage, since this step necessitates Assange’s prior incarceration. It is perhaps only within this context that Ny’s actions could be deemed appropriate. The case should have been dropped in October 2010, when forensic analysis showed that the famous ripped condom, which served as her material evidence to re-open the investigation, was a fake. Ny’s refusal to question Assange in a safe place has also permitted her to withhold other exculpatory evidence from his defence team; namely electronic records of conversations between her two clients, before they went to the police station to make an enquiry about STD testing. Ove Bring, a Swedish professor emeritus of international law recently stated that the charges against Assange would probably have to be dropped following an interview, since ”the evidence is not enough to charge him with a crime”. That would appear to be an understatement, but as Naomi Wolf has pointed out, none of the Swedish players seem to be going for a win, since that is not the point of getting Assange to Sweden. Marianne Ny is not the only one who is pushing her professional integrity to the limits. Australia’s Prime Minister Julia Gillard, who is also a lawyer, publicly announced that Assange had committed an illegal act by publishing material that had been sent to Wikileaks. 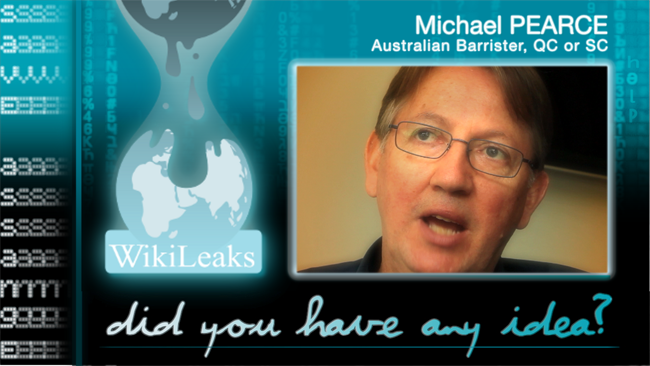 Craig Murray, ex Bristish Ambassador to Usbekistan, not only informs us that other ambassadors around the world do not agree with the actions of Britain’s Foreign Minister William Hague; he also makes it clear that Mr Hague will be putting local police at risk of extradition to Ecuador if they enter the embassy to arrest Assange. Back in Australia, Foreign Minister Bob Carr claimed that there was not the slightest hint that the US was gunning for Assange, only a week before news of the Grand Jury investigation broke. He was also contradicted by diplomats at the Australian embassy in Washington, who expressed no doubt that a request for extradition was on the cards. On July 12th 2012, Australian Greens Senator Scott Ludlam challenged Bob Carr’s persistent denials that Julian Assange is in danger. Who would doubt it now, given the desperate measures numerous public figures are taking, and the international crisis that is building over the capture of someone who has not even been charged with a crime? Australians should take note of Senator Ludlam’s assessment of the situation and respond en masse by writing IMMEDIATELY to their MPs; to demand not only consular, but political and diplomatic support for their fellow citizen. It is now appropriate that the Australian Government reiterate their request for DUE PROCESS according to international law, no matter how embarrassing it feels to argue Assange’s position as Australia’s first political refugee. Safe passage to Ecuador must be granted by the UK and if Sweden refuses to question Mr Assange before he goes, so be it. Ecuador are convinced that he will be exposed to the risk of “temporary” surrender to the US – the terms of Obama’s NDAA can make that rather permanent – if prosecutor Ny’s wishes, and hers alone, be granted. This entry was posted in EDITORIAL, LIVING PROOF, NEWS and tagged Bob Carr, Craig Murray, David Hicks, Ecuador, Ecuadorian Embassy, Julia Gillard, Julian Assange, Marianne Ny, Michael Pearce QC, Naomi Wolf, NDAA, Obama, Senator Scott Ludlam, Susan Benn, Wikileaks, William Hague. Bookmark the permalink. Bravo! And for those who are now looking for outstanding links to further investigate the unbelievable injustices being visited upon Assange, Wikileaks, freedom of speech, the press and expression per se – please read all of the below links. Then realise that this is happening for one reason and one reason only. A guilty but hugely powerful war criminal of a nation (the USA) does not like being shown up for what it is, and want to put a Walkley Award winning Aussie JOURNALIST in jail for nothing other than telling the truth. Worse, your current Australian “Government” (such as it is) – is not only DOING NOTHING to protect Assange – but is actively conspiring with the USA in every way possible to ensure he is renditioned to USA hands, one way or another. Julia Gillard, Bob Carr and Nicola Roxon are all guilty of not representing the Australian interest: they are US stooges, and as such are effectively acting treasonously. They should be held to account. Make some noise. Contact your local member. Write them. Phone them. Get educated about the facts. If you are not OUTRAGED you are simply not paying attention. Believe it or not the propaganda machine in the US is producing Julian Assange Terrorist Cards – to indoctrinate children from a young age – clearly they’re in this for the long haul. Full summary of Assange & Wikileaks affair, by Democracy Now. Wikileaks summary of the Assange case. Awesome article by Glenn Greenwald, showing mainstream media (MSM) hypocrisy, jealousy and viciousness, as it applies to Julian Assange and Wikileaks. Another great article by Greenwald which highlights the hypocrisy of Western nations and media (in the context of Ecuador granting Julian Assange asylum. Keep em coming mate. Your contributions are more than welcome. You may be interested to read my rebuttal comment of one of the most vile and deluded rebuttal pieces I’ve yet seen (re a recent article of John Pilger’s). Talk about twist and spin … my word! My comment is reply 13. Enjoy! Wow Colin. That article about CIA involvement in Australia is truly a revelation. I’m amazed at how far it goes back. Exactly…the Swedes ” not going for a win” is insightful….and doesn’t make joining the dots to the US grabbing him too hard. Woeful and sneaky efforts by Carr and Gillard … sub standard people. Not much value in being an Aussie is there ..when it really matters..